A lot of people seem to think it’s still summer—yesterday’s sweltering 88 degrees contributes to that misapprehension. Birds know better. Days are noticeably getting shorter, most baby birds of the year are on their own now, and adults are recovering from the rigors of raising those young birds—many have finished molting into new feathers and are ready to head south. NEXRAD has been showing some migratory events already, and even though birds are quiet, we can’t help but notice that a lot of them are starting to pass through. 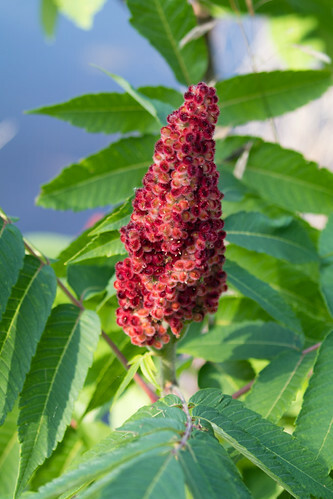 I went out to the Western Waterfront Trail yesterday for a short walk. I’d hardly stepped onto the path from the parking lot before I was seeing lots of birds. A Red-eyed Vireo family. Five Ovenbirds that I assumed were a family unit. A couple of Veeries hanging out together. Two adult Cedar Waxwings with a growing fledgling. Lots of goldfinches flying this way and that. A noisy Blue Jay family. 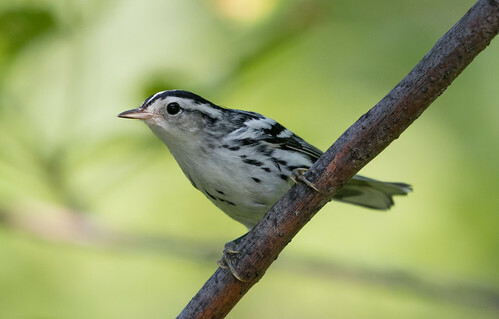 A few Nashville Warblers and two immature Magnolia Warblers—those two species don’t nest anywhere near the Western Waterfront Trail, so I’m assuming they were migrants. 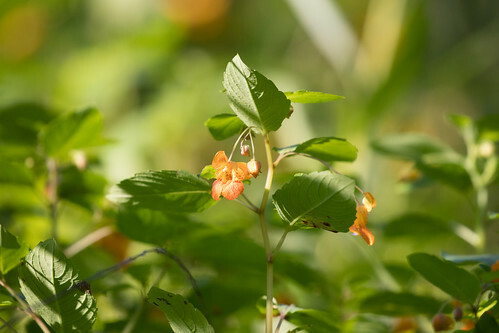 Berries abound, and tasty insects were everywhere, as my many mosquito bites attest. 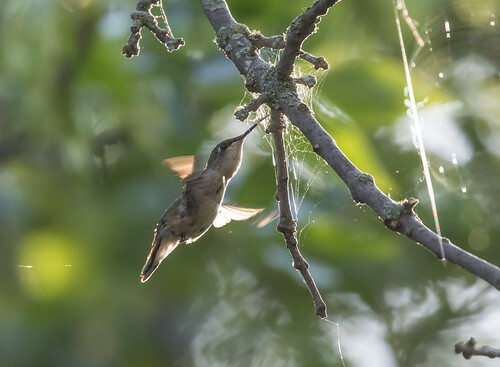 One female Ruby-throated Hummingbird snatched insects from a spider web. It’s interesting to consider how some of the mosquitoes that bit me would in turn be eaten by birds, so my blood is providing at least a few of the calories fueling migration. We really all are in this together. It takes a village. One American Redstart, two Song Sparrows, and a Swamp Sparrow were still belting out a song now and then, but most of the birds I saw were pigging out in small family units or mixed flocks moving with the local chickadees. I have a new field recorder that I’m trying to get the hang of before heading out on three major work-related trips this fall, and I was also trying to photograph some birds. I missed pictures of the Ovenbirds because it took too long to put away my microphone to switch over to my camera—Ovenbirds don’t approve of paparazzi in the first place, and are certainly not going to sit around waiting while a photographer gets organized. 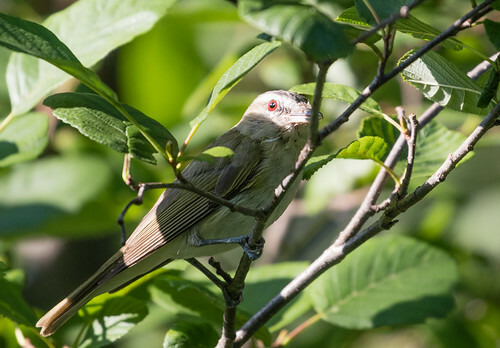 I got dozens of photos of Red-eyed Vireos, but the lighting was awful. Most of the birds I saw were high up and not interested in posing. 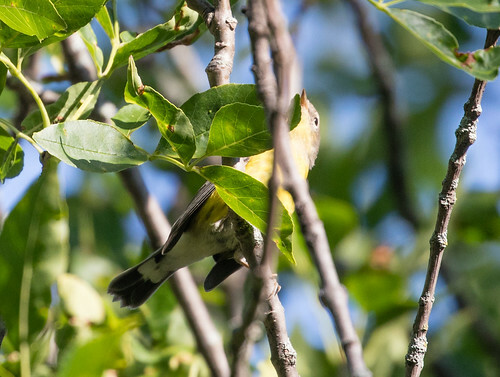 I got a couple of photos of an immature Magnolia Warbler—the photos are poor quality and most of the bird was obscured by leaves, but you can still see the one field mark that distinguishes it from any other warbler—the large white area at the base of the tail with the thick black tail tip. 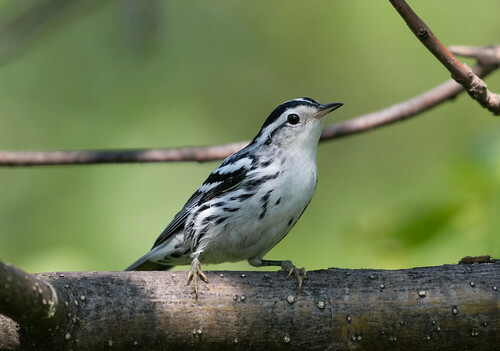 Fortunately, one female Black-and-white Warbler took pity on me and spent an inordinate amount of time posing this way and that on a nearby branch in perfect light. If only a few birds are singing, the rest are not exactly silent. 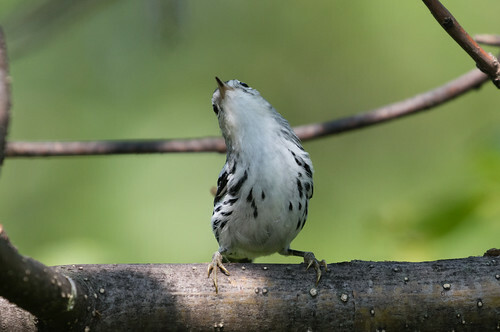 They gravitate to chickadees, which make several little calls even when not chickadee-dee-deeing, and the warblers occasionally let out a call note themselves. I miss most of that if I’m not wearing my hearing aids, but I’ve been quite good at remembering to pop them in. It was windy, but the best thing about good digital hearing aids is that they selectively boost the sounds you want to hear, making them clearer against background noise. It wasn’t a big day for auditory or visual pleasures, but that made the birds I did find all the more precious. 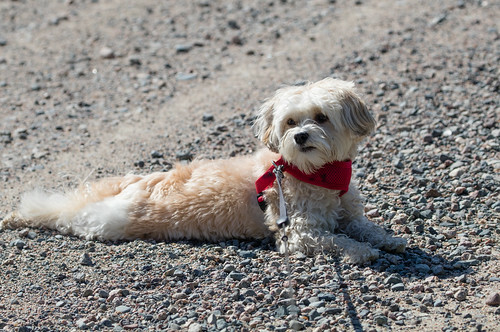 This weekend I headed to the Sax-Zim Bog with my little dog Pip and my good friend Lisa. We’re in the silent part of summer now, when parent birds are busy chasing their little ones around more than singing, but we got to hear a surprising number of birds on Nichols Lake Road when we first arrived at 6:30. It was extra fun because Lisa had never been to the bog before, and is pretty new to birding. Most thrilling for me were the two Winter Wrens who sang several of their long, silver-threaded songs. I simply cannot hear them without smiling. A few Alder Flycatchers sang pretty persistently, as did a few Red-eyed Vireos. The only warblers singing were Common Yellowthroats. 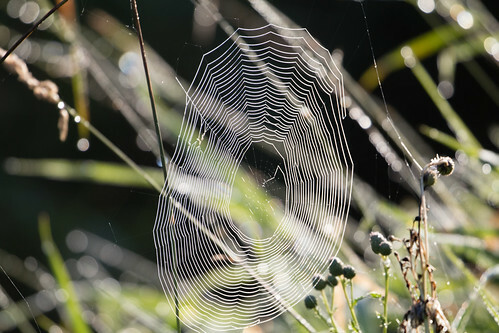 To provide visual beauty to enhance the soundtrack, dew-clad spider webs dotted the landscape. My photos were taken too far away to capture the beaded pearl effect of dew along each strand when viewed from close range, though the best of my photos show at least a hint of that. The birds quieted down and the spider webs dried off as the sun moved higher in the sky. And that was about it for the day as far as bird song. Not that the birds disappeared. While we were still on Nichols Lake Road, a large loose flock of robins gathered along the gravel road looking for exposed bugs and worms, and a few flickers flew up from the roadside, too—this time of year, they are seen more often than not on the ground pigging out on ants to fuel their migration. 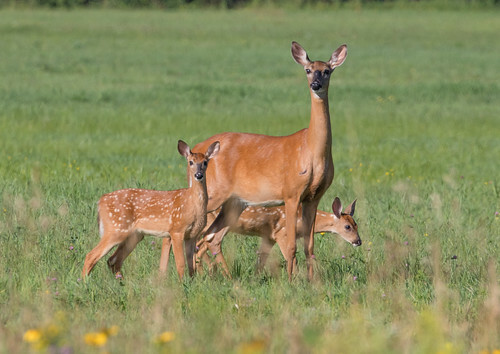 Next, Lisa and I moseyed along to Arkola Road, where we quickly came upon a deer and her twin fawns grazing in a lush meadow. Unfortunately, we saw them just as they saw us, and the mother was not interested in photo ops—I managed to get one shot before they took off. Along the roadside, we spotted several tent caterpillar webs, but I didn’t see any cuckoos on them, even though tent caterpillars are their preferred food. 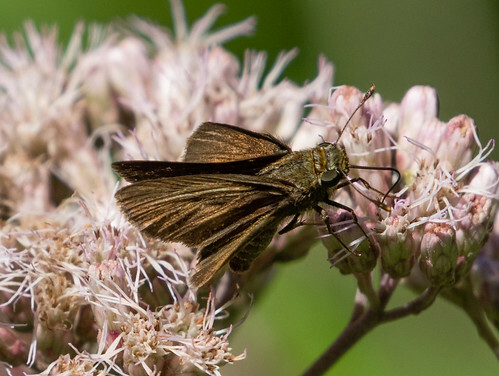 One cuckoo did fly across the road, giving me a split-second look, but Lisa and Pip didn’t get to see the exquisitely lithe, long-tailed beauty before it retreated deep into the trees. We all did get to see an active Eastern Kingbird family—they didn’t cooperate for photos, but I got to lecture Lisa and Pip about how this species has the coolest scientific name of all, Tyrannus tyrannus. Next we traveled down Owl Avenue, where we didn’t spot any owls, and turned off at the Sax-Zim Bog Visitor Center, where we didn’t spot any visitors—at least not human ones. 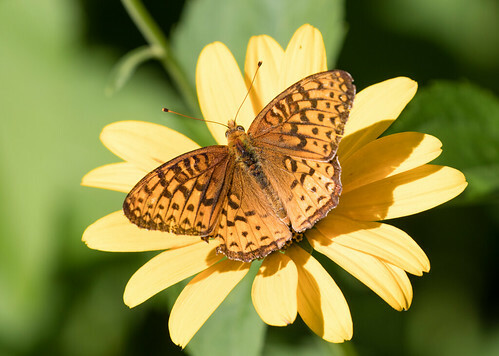 An Atlantis Fritillary, several little skippers, and a host of bees sipped nectar at the flowers, a Chestnut-sided Warbler ate a few caterpillars, a Great Crested Flycatcher lurked in the foliage, and a hummingbird zipped by. It was one of those lovely end-of-summer days when you can savor every little thing without other little things interrupting. We continued down Owl Avenue to Correction Line Road, and took what I call the “Tree Loop” off Highway 133, spending a few minutes on Blue Spruce Road watching a pair of adult Broad-winged Hawks flying with a young bird. 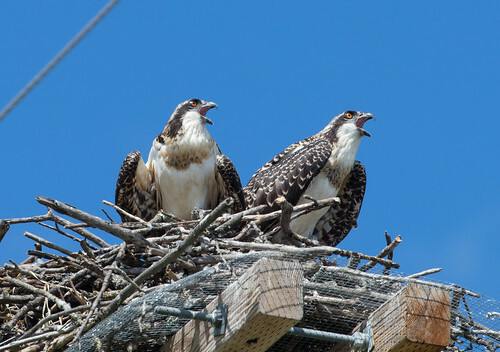 On the drive home we stopped briefly by the old Twig Bakery off Highway 53 to check on the two baby Osprey. They looked at us a bit but mostly squawked for their parents—they’re getting close to fledging. All these baby birds testing their wings gave us hope, and on that note, we headed home laden with memories and lots of photos of our lovely morning in the bog.